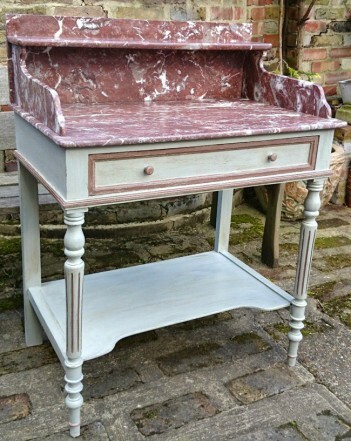 This is a 19th century french oak washstand with its original marble top. We have painted it using Grand Illusions Chalk Paint in Shutter, we have then picked out the detail in a red to match the marble. Finally we have sanded and applied brown wax to give the piece and aged look. The marble is in excellent condition. Please click on the photo to see a larger image.